Citation: Niyogi M. Vegetarian diet: A preventive for mental diseases. J Food Nutr Health 2018;1(1):10-15. Mental diseases, Amino acids, Optimum dose, Side effects, Serotonin, Neurotransmitter, Schizophrenia. Mental illness is a matter of great concern throughout the world. According to Geneva report  one in every four people in the world will be affected by mental or neurological disorder at some point of time in their lives. Presently, about 450 million people are suffering from the above condition. The release of DSM5 has added to the concern of mental disorder in the world. In Indian perspective, the mental illness poses a gloomy scenario. As per WHO report  7.5% of Indians suffer from mental disorders. The NIMHAN’S study  focuses that 13.7% Indians are mentally ill.
An overall study of mentally depressive patients in the world  India finds its position after U.S.A and China. The severity of mental illness has ignited the eagerness among scientists and doctors to search for the cure and prevention of the above because ill mental health robs the patient of his youth, activity and peace of life. So many medicines have been discovered for various symptoms of mental diseases which can be successfully prescribed by the doctors to the patients. For that the therapists have to make a keen observation of the patients to select the proper medicines with optimum doses which is a very difficult task. The other difficulty, the doctor’s face  is that every medicine has got side effects for which, very often the patients are reluctant to take the medicines and continue with the same. So along with medicines, psychoherapy plays an important role to convince the patients of urgency of taking medicines tolerating the pain of side effects. Alternative thoughts of treatment are, if the side effects could be avoided because in the initial stage of treatment side effects of medicines are more prominent than the main effects. So, from the very childhood precaution should be taken so that mental illness does not occur to any person. Apart from social and environmental pollution which could give rise to mental disorder, lack of selection of proper food could be one of the main reasons for the disorder mentioned above. Here come the roles of the dietitians and nutritionists to tackle the unwanted situation. Proper advice for the food habits of the children and grownups could help them avoid mental disorder . The protection of mankind through suggestion of optimum food against mental illness has the beauty that it has no side effects. Once one is completely affected with mental disorder, food alone cannot help the patient overcoming the illness. In that situation medicine is a must for the patient. Dieticians can suggest proper food to children and adolescent to avoid mental diseases. Amino acids in food supplements are good safeguard against mental disorders like major depression, bipolar disorder, schizophrenia and obsessive compulsive disorder (OCD). Thus a dietician has to recommend foods which contain sufficient amino acids. These amino acids reduce symptoms of mental disorders because they are converted to neurotransmitters that alleviate depression and other difficult mental disorders. In this context, an investigation in the sufficiency of the above in a vegetarian diet  could be important. Since, the diet above has found its successful presence in so many aspects [7-11], it is most tempting to find its ability to supply the optimum amount of amino acids. This optimum amount when supplied does not cause side effects and can be considered as medicine without side effects against mental disorders. In this article, the amount of amino acids, obtainable from the daily diet  has been evaluated. Amino acids estimated from the diet consist of two types like essential and nonessential ones. These acids are designated as Tryptophan, Lysine, Methionine, Phenylalanine, Histidine, Arginine, Alanine, Glutamic acid, Glycine, Tyrocine, and Serine and branched chain amino acids viz. Isoleucine, Leucine and Valine. Since the diet proposed involves variety of food that contains legume, vegetables, cereal, dairy products and fruits, estimation of the amount of the above acids from each element of the diet has been calculated and added them up to get the net result. The result so obtained has been compared with daily intake amount necessary as precautionary measure against the disease. By consumption of the necessary amount one is guarded against the diseases. Also presented here the medicinal doses which are essential for treatment when one is affected with the diseases. In the present investigation, estimation of the amount of amino acids present in every item of the daily diet has been made separately. They are then added up to get the daily intake of the above from the proposed diet. The daily intake of the amino acids necessary as safeguards for mental diseases [12-14] have been found out. The medicinal doses [15-19] of the above amino acids have been studied and incorporated in the investigation. The results have been presented in Tables 1 and 2. Table 1 contain the minimum amount of various amino acids obtainable from the diet, the minimum amount of the above acids necessary as daily intake for precautionary measure against mental diseases and the minimum doses of the amino acids as medicinal doses when one is affected with mental diseases. Table 1. Minimum amount of amino acids. Table 2 gives the maximum amount of the above respectively. Table 2. Maximum Amount of Amino Acids. From Tables 1 and 2, it is found that the amino acids available from the proposed diet successfully cover the daily intake amount both minimum and maximum wise. This indicates that any person following the diet is guarded against the mental diseases which arise out of the deficiency of the above acids. The medicinal doses for the amino acids are much higher than the daily intake amount, as well as, the amount obtainable from the diet, which means that when somebody is affected with any mental problem he cannot be cured with diet only, some medicine is also necessary. The minimum daily intake amount for methionine and lysine are more than the minimum amounts obtained from the daily suggested food. So for successful application of the diet one must take care so that the maximum amounts of the above acids are consumed by a person by proper selection of diet elements. Another point to be mentioned here is that the minimum medicinal doses of methionine and lysine are lower than the amounts obtained from the diet as well as the daily intake amounts . But that is not a very significant problem; the only care to be taken is to prescribe larger doses of the above when a person habituated with the proposed diet is affected with diseases for lack of methionine and lysine. The results of Tables 1 and 2 are depicted in pie-charts of Figures 1-6, where approximations up to two decimal numbers have been made while drawing the charts. Figure 1: Minimum amounts of amino acids from proposed diet in gm/day. Figure 2: Minimum amount of amino acids as daily intake in gm. 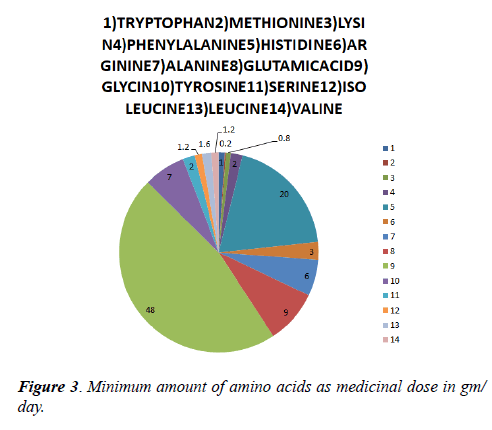 Figure 3: Minimum amount of amino acids as medicinal dose in gm/ day. 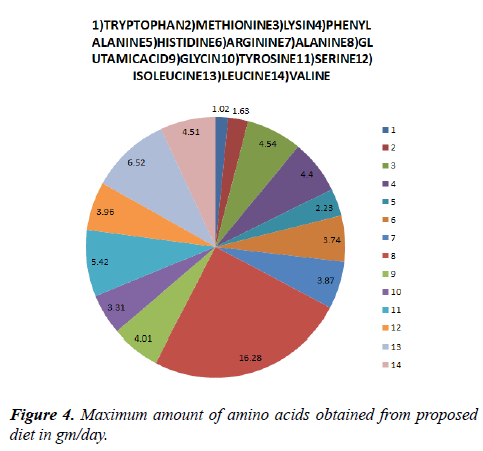 Figure 4: Maximum amount of amino acids obtained from proposed diet in gm/day. Figure 5: Maximum amount of amino acids as daily intake in gm. 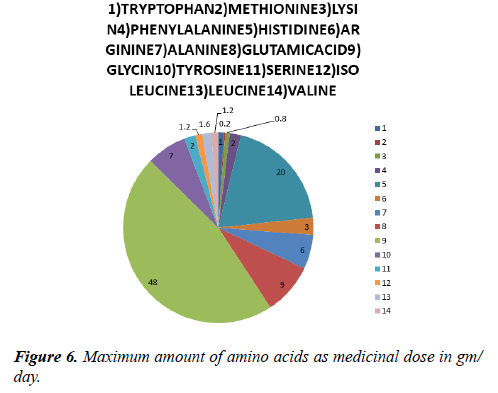 Figure 6: Maximum amount of amino acids as medicinal dose in gm/ day. In these charts, Figure 1 represents the minimum amounts of amino acids obtainable daily from the suggested diet, Figure 2 shows the minimum daily intake amount necessary while Figure 3 gives the minimum medicinal doses of the above amino acids for various mental diseases. 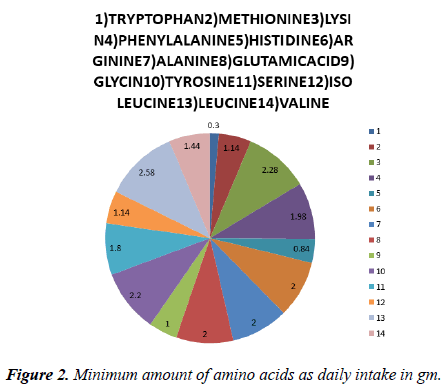 Similarly, Figure 4 shows the daily maximum amounts of amino acids obtained from the suggested diet, Figure 5 represents the maximum daily intake amount necessary and Figure 6 gives the maximum medicinal doses of amino acids. After presenting the data for the various amino acids it may now be interesting to discuss in brief the mechanism of the above acids in relation to brain function and applicability of each of them to various mental problems and the medicinal doses thereof. Table 3 below records the results of the investigation for the above. Isoleucine Isoleucine, Leucine and Valine are the three branched chain amino acids whose mechanism is the same with ratio 3:4:3. Branched chain amino acids influence brain function by modifying large, neutral amino acid transport at the blood brain barrier . Anorexia 4 with Iso-leucine 1.2, Leucine 1.6 and Valine 1.2. Leucine Mania 60 with Iso-leucine 18 Leucine 24 and Valine 18. Table 3. Amino acids, their mechanism for the diseases and medicinal doses. Mental diseases are matters of serious concern. Scientists are searching for the remedy of the above diseases. But remedy for the diseases could be painful so it would be beneficial if we could take care so that the above diseases could not attack us. Amino acids in our daily food habits could play important role to that end because by selection of proper food we could supply the daily intake amount of amino acids which could prevent the diseases to attack us. In the investigation it is shown that by a choice of proper vegetarian diet it is possible to avoid so many mental diseases. However, when somebody is affected with the above diseases food habits alone cannot supply sufficient amino acids necessary for the treatment of the diseases. In those cases medicines are essential because the medicinal doses for treatment of diseases contain larger amount of amino acids as has been shown in Table 3 of the investigation. I gratefully acknowledge the help received from Mr. D. Niyogi in this work and preparation of the manuscript. Daily intake of eight essential amino acids. aminoacidstudies.org. L-arginine in the treatment as usual to schizophrenia. clinicaltrials.gov. Glycine: The amino acid that benefits your entire body. Dr. Axe. Fernstrom JD. Branched-chain amino acids and brain function. J. Nutr. 2005;135:1539S-46S. Garlic PF. Toxicity of Methionine in human, American Society for Nutrition. 2006. Hawkes E. D-Alanine for schizophrenia. schizophrenia.com. Himmerich H, Erbguth F. Nutrition and dietary supplements in psychiatric diseases. Nervenarzt. 2014;85:1512-20. Hough L.B, Dynamics of histamine in the brain. Department of Pharmacology and Neuroscience, Albany Medical College. Iyer M. WHO report, 2017. Times of India. Kamath V. Nimhans studies, Mirror Bureau, 2016. Kantrowitz JT. High dose D-serine in the treatment of schizophrenia. Schizophrenia Research. 2010;121:125-30. Lakhan S. Nutritional therapies for mental disorder. J. Nutr. 2008;7:147-289J. Levy UH, Daniel C, Marina E, et al. Efficacy of high dose Glycine in the treatment of enduring negative symptoms of schizophrenia. Arch Gen Psychiatry. 1999;56:29-36. L-Arginine effects on the brain; disorders like anxiety and schizophrenia. livestrong.com. McPhillips D. U.S among most depressed countries in the world, Data Editor. 2016. Niyogi M. Well planned vegetarian diet with MSM. AJFN. 2015;5:30-5. Niyogi M. Estimate of micronutrients in a dietary model. AJFN. 2015;5:49-56. Niyogi M. Polyphenol in a vegetarian diet. AJFN. 2016;6:113-6. Niyogi M. Health benefits of phytonutrients present in a dietary model. IJFANS. 2017;6:67-79. Niyogi M. Antioxidant activity of a vegetarian diet, to be published in IJFANS. 2018. Daily recommended dose of glutamic acid, Planet Ayurveda. Strand E. An amino acid that brings feelings of calm, relaxation and sleepiness. 2016. Sai TG E. D-Alanine added to antipsychotic for the treatment of schizophrenia. Biopsychiatry. 2006;54:230-4.